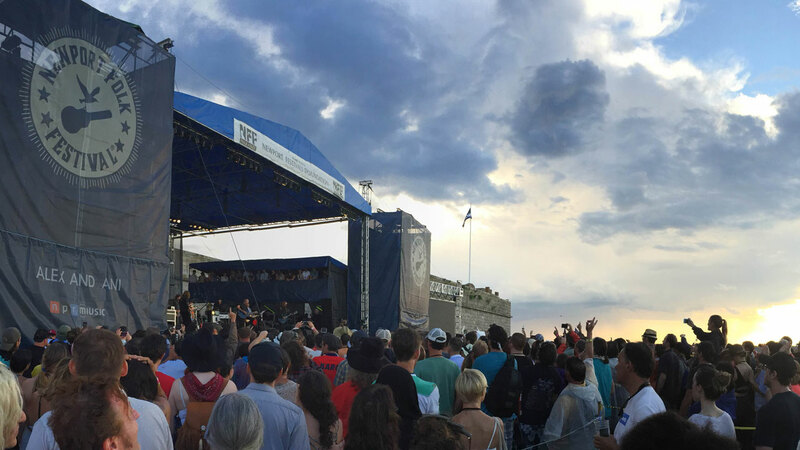 Collaboration and surprise were the words of the day as Newport Folk Festival opened its 3-day run at Fort Adams State Park by the sea in beautiful Newport, Rhode Island. The heritage festival had been sold out for weeks, and ticketholders knew they were in for something very special. There was an unannounced slot on the main stage Friday and rumors buzzing about what shape the headlining Roger Waters set would take. When I saw Jim James backstage, I knew what we we'd be in for! The Lone Bellow returned to Newport for their first main stage performance, which burst out of the gate with their new album-opening track, "Then Came The Morning." The vocally complex song generated instant fan reaction with lead singer Zach going crazy on stage. New Breed Brass Band, Sara Watkins, Lucius and Leon Bridges all joined the band for surprise appearances. They performed the gospel-based "Watch Over Us" gathered around one mic, with Leon Bridges harmonizing. Just magical! Calexico and Iron & Wine with Ben Bridwell had back-to-back sets that clearly suggested collaboration. Calexico invited Sam Beam and Ben on stage for their musically wide-ranging set. And then the beautiful Sam and Ben set included the most unlikely Sade cover ever -- Sam on lead vocals on "Bulletproof Soul," which is on their new Sing Into My Mouth album. My Morning Jacket hit the main stage for their unannounced set doing songs from the new album. Jim James was in great voice, and Jacket simply has the tightest, most fun rhythm section going. First Lucius joined in and then Roger Waters stepped on stage as the rain hit to a rousing reception from the increasingly soaking wet audience. He opened the set saying, "This is the one new song we're going to do tonight," kicking off a set of Pink Floyd and cover tunes backed by My Morning Jacket. Wow! Amy Helm flew in on a red eye to join them, Sara Watkins added impeccable violin solos, and barely a soul left Fort Adams until the last note. Roger Waters was wholly reverential on stage to the legacy of Newport and American folk music in general. He said he was honored to be performing at Newport, and covered John Prine, Bob Dylan and Levon Helm (joined by Amy). "Wish You Were Here," especially, was a concert moment I hope I never forget. Heartfelt thanks to them all.